For many, Dr Beeching will always be the bogeyman. For those wishing to be more objective though, there are, fortunately, various publications that look back more critically and more objectively at both the man and the report, which arguably changed the face of rural Britain. It is also easy, with the benefit of hindsight, to be critical at the damage done without taking into account how the world was at the time. It must not be forgotten that at the end of the day this was a government decision made in a democratic country, and for those keen to blame the Conservative Transport Minister Ernest Marples, a rather dubious character of questionable ethics, it must also be remembered that most closures (some of which went beyond those recommended by Beeching) actually happened when Harold Wilson was Prime Minister – and his role in all this is one of considerable debate. Given the impact that the Beeching Report had on the railways of the UK, this anniversary seems a good opportunity to take a more detailed look at what it actually contained, and more specifically how it affected London. Although often forgotten, it needs to be borne in mind that there were two reports produced by Dr Beeching. The first, that which came as a bit of a bombshell and proposed a large number of station and route closures, is the one highlighted above. One can imagine it took the country a long time to get over the shock. It was probably just a big a shock then when the second report, rather euphemistically called The Development of the Major Railway Trunk Routes called for a drastic pruning of many main routes that people assumed were safe. In this article, we’ll focus on the first and more (in)famous of those reports. After WW2, Britain’s railways found themselves in a terrible state. The run-down railways, and indeed road freight, were nationalised in 1948. This put them in the charge of the British Transport Commission, which was generally perceived to be too large an organisation and one that was lacking in focus. Indeed the BTC did not appear to have any clear objective – it was as if the objective had been nationalisation itself and no-one had thought much beyond that. There seemed to be an assumption that it would pay its way and, unlike the previous railway companies (and ICI), it was not concerned with paying its shareholders a profit. It would appear to be very difficult to deduce on what basis it would have concluded that a railway should remain open or not or on what basis new schemes should be introduced. At the time of Beeching, economics was also not the refined art it is today. Cost Benefit Analysis was not a new concept, but it was not in common use in Britain (indeed the approval of the Victoria line was one of the first projects to benefit from CBA). It thus probably would not have occurred to Marples, or indeed many other people, that the roads generated no income and so effectively could only be justified on this basis – and if that was true for the roads, then why not the railways as well? Like many works that become notorious and condemned, it is probable that few critics have actually read the report. This is a mistake as although one can fault some of the assumptions it makes, the report is also a masterpiece of logic, clearly explained, and pulls no punches as to the state of railway finances and the hopeless disparity of some of its loss making services. Indeed the first page of the report rather nicely highlights the situation that Beeching had found himself facing – it apologizes for the time taken in presenting its findings, but blames the fact that the financial figures necessary to form any basis of a sensible decision were just not available. One of the most quoted statistics from the Beeching report is that “one third of the route mileage carries only 1 per cent of the total passenger miles”. The report also goes on to say that “one half the total route mileage carries about 4 per cent of the total traffic miles”. Elsewhere, it points out that the least used 50% of stations did not even generate sufficient revenue to cover the running costs of the station itself, let alone contribute to other expenses. Interestingly, despite this and a lot of discussion of alternatives in other places, it does not seem to suggest a drastic saving by leaving stations unstaffed. This is likely because the report seemed to demonstrate that if a service could be sufficiently catered for by a “rail bus,” then the contribution to track costs would be so small it would be bound to be uneconomic anyway. To a greater or lesser degree, the pattern of life in all these areas is dependant upon continued operation of the suburban rail services, and to the life of London they are essential. It is, therefore, unthinkable to most people that these services should be closed, but there that is no reason why they should be provided below cost. It’s an intriguing statement, but unfortunately this does seem to be one place where the report is not as clear as it should be. The obvious interpretation is perhaps that Beeching expected railways to pay their way and that the passenger should be charged more. This would seem consistent with the brutally harsh analysis that precedes it, but it’s possible that the report anticipated the British Railways Board receiving full payment from whatever source to cover costs, with no cross-subsidy of services – something which it must have known would be totally unattainable due to the few services, if any, that made a profit. This is a situation that must be of very real concern to the public, as well as the railways, and it cannot be in the best interests of either to restrict fares to the low levels at which they are presently controlled. If any sentence could highlight the real problem of the time then it is this. Full marks to Richard Beeching for making it quite clear as to the basis for his proposed action in suburban areas. What the report fails to do, however, is to make the case for fares to be subsidised, or indeed for transport to be improved, even if it is known it would make a loss – certainly the case with the Victoria Line being constructed at the time. It would arguably not be until the era of the the politically-savvy chairman Peter Parker that the importance of this approach would be appreciated, and the cause of investing in the railway for the benefit of the whole metropolis would be championed. There is also another feature which is important from a commercial point of view. The rail system is capable of drawing passengers travelling daily to London from distances up to a hundred miles, and has ample spare capacity for doing so beyond a radius of about 20 miles. It is, therefore, in the railways’ interest to foster the growth of this longer distance traffic to achieve higher utilisation of the route system as a whole, but this development is itself restricted by the congestion of shorter distance traffic at the London end. The paragraph above highlights a recurring theme of the report that ties into this viewpoint. Long distance traffic is profitable, short distance isn’t. It also makes you wonder if this was a serious proposal, or a veiled threat to the government. Subsidise our suburban traffic – or we will ditch it and follow the money. The right solution is most likely to be found by “Total Social Benefit Studies” of the kind which are now being explored by the Ministry of Transport and British Railways jointly. In cases of the type under consideration it may be cheaper to subsidise the railways than to bear the other cost burdens which will arise if they are closed. If this happens, however, there should be no feeling that the railways are being propped up by such a subsidy because of a commercial failure. Bizarrely, however, the report never seemed to make the connection that this logic should also apply to the metropolis itself. It seems a strange omission, but perhaps a partial answer for it can be found in a discussion of suburban services outside London. Much is made of the fact that the railways are competing against municipal bus companies who are either council owned or subsidised. The implication is that it may be cheaper to pay the relatively small loss the railway makes instead of abandoning the railway which would implicitly lead to more subsidies for buses. Such a situation would not occur in London and probably, even in 1963, it was recognised that it would be wholly impractical to replace rail services in London with buses. It does seem with hindsight, however, absolutely inexplicable that the report does not put forward a case as to why fares in London should be subsidised. If that was a step too far, then at least a precedent had been set with the Victoria Line and an argument could be make for capital works improvements to be paid for. The only sensible conclusion for the difference between London and the provinces is that in the case of the provinces an argument could be made to show that a subsidy could actually save the national or local government money – especially if the buses and trains were part of an integrated co-operative system. In London there was no such opportunity. Indeed there was probably also a feeling that the suggestion of a permanent subsidy – for that is how it would be perceived – would not go down well with a government that was trying to reduce the amount it was paying for the railways. It should be clearly recognised that the problem presented by the London suburban rail services is not one that the railways can solve alone. Their problem is part of the whole problem of London congestion, and measures which would improve their situation, such as the staggering of hours and dispersal of employment to the periphery of the metropolitan area, are beyond their power and responsibility. Also, unless the control of fares in the London Traffic Area is exercised with more regard to the true nature of the problem, the position will be further worsened by the continued suppression of normal economic forces. The end of the paragraph above is telling. To Beeching it was the suppression of “normal economic forces” that was at least part of the problem. In this he was arguably right in that it it was this suppression which caused the British Transport Commission not to keep a tight rein on things. It suggests, though, that he still nurtured the idea that a city’s transport system could be run on the basis of normal economic forces. History has demonstrated that while that is occasionally possible in places such as Hong Kong, it is generally unattainable and, in fact, undesirable even if it is. That this was not obvious to Beeching then may seem strange to us now, but it is important to remember that the Beeching Report was as much a product of its time as it was of its author. The Age of Expansion: The initial free-for-all of private investment for the purpose of making a profit, marking the creation and explosive expansion of the original railways. The Golden Age: A period dominated by London Transport and the “Big Four” taking a centrally organised approach in the days when few people had a car. It worked, so long as enough income came in to cover costs. The Decline: The post WW2 years up to the end of the century when public transport was generally perceived as a “problem.” It was never going to pay its way, but the advances in economic modelling that would justify its subsidy in the overall economic interest of the city had not been developed. The Silver Age: A period marked by the creation of the GLA and Transport for London. The start of a period where London’s transport was finally placed on a sound economic basis and its true value understood. Although financial prudence is expected, there is no expectation that transport will directly pay its way. 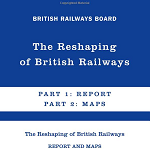 Looking at the report from within that most recent phase naturally colours our perception of its findings, but the Beeching Report was published deep in the heart of that long, third phase. With that in mind, its conclusions are perhaps more understandable, even if they seem wrong to us now. It is perhaps no surprise that when it came to the situation in London, the report could effectively find no solution. Indeed even if it had then it seems unlikely that the world, or at least the British Government, would have been ready for it. Ultimately, the Beeching Report is a far more complex document than it is sometimes presented, and the reasons for the conclusions that it reaches are perhaps more understandable when they are considered in the context of the time – even if those conclusions can now be disputed. Was Beeching really a “bad man”, or just a decent man trying to do a very difficult and unpleasant job simply because of his predecessors failure to do their job properly? Whatever Beeching was, he was not duplicitous and on that basis he behaved far more honourably than many politicians of the day appear to have done. Whatever coverage the Report’s anniversary receives in the coming months this, and the fact that the report is a far more complex document than it might first seem, deserve to be remembered. Next we will take a look at the direct impact the Report ultimately had on London. It may surprise you.